The ‘Activities’ allows NET.Notes system to store communications within the company and with cutsomers. This includes both the records of meetings and phone calls, as well as records of electronic communication via e-mail. For this purpose, NET.Notes is using ‘Incoming emails’. The system uses communication via IMAP to display the user’s email messages. Initially, the user is prompted to login to his inbox and then all his messages display in NET.Notes. Users can open message and see the body and it’s attachments. 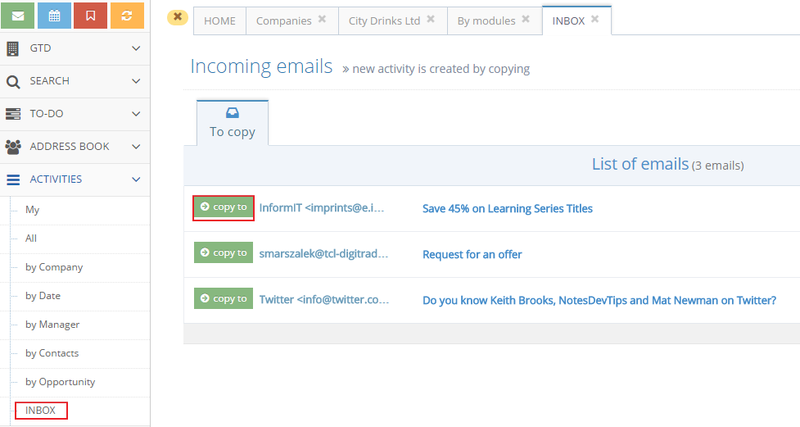 Using the ‘copy to’ button email is converted to activity. By creating an activities, a contet of email will be stored in NET.Notes and can be assigned to the company, project etc., so information will be available for other NET.Notes users .